Click play below to watch a video with lots of information about MRI. Ready to Practice? Click here to download the MRI sounds so that your child can become familiar with the MRI environment. 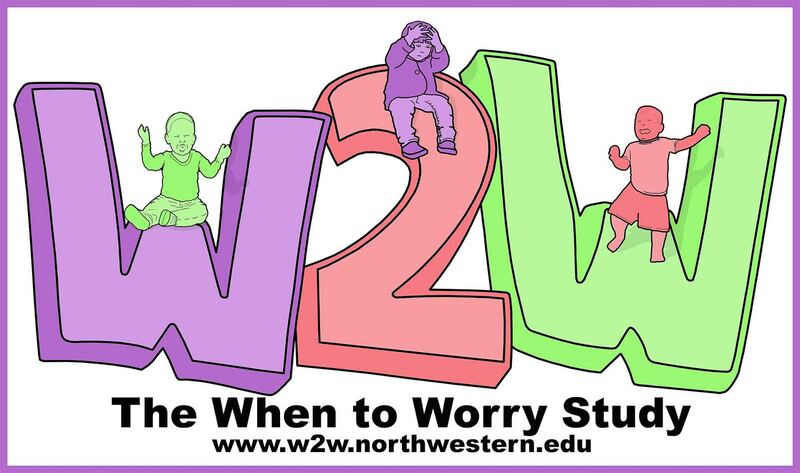 You and your child have been invited to participate in a MRI scan for the When to Worry Study. The MRI is like a special camera: it allows us to collect detailed images of your child’s brain while your child takes a nap. These images are an important way for us to understand how babies’ brains relate to behavior and development. 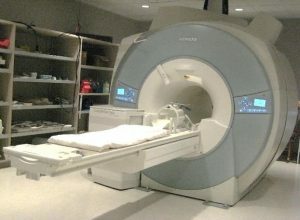 The MRI scan will be used for research purposes only and is not intended to diagnose any condition. The MRI scanner uses a strong magnet and radio frequencies to generate pictures. There is a bed portion that will slide into the tunnel portion once your child has been positioned for their scan. Yes, MRI is very safe. It is completely non-invasive meaning there are no needles, no chemicals or medications, and no radiation or x-rays are involved. The MRI scanner does make some loud noises while taking pictures, so hearing protection is always provided to anyone who remains in the scanner room. We are happy to answer all of your questions about safety. When will the MRI scan take place? 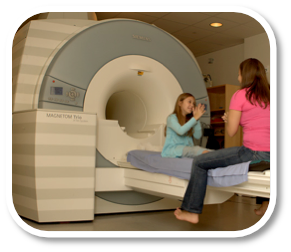 We will work closely with you to determine the best time to have you and your child come in for the MRI scan. We will be scanning your child while they are sleeping naturally. (There is no sedation or medication.) The ideal time would be when your child takes their routine nap. Bedtime is also an option. We will plan the visit so that you are able to perform your normal naptime routine, allowing your child to fall asleep before going into the MRI scanner room. What can we do to prepare for the MRI? We can provide you with a CD or mp3 files of typical MRI sounds that you can play for your child during regular naptimes to get them used to the MRI noises. We will ask you to bring any naptime essentials such as a blanket or stuffed animal with you. Sometimes it’s helpful to have your child be awake for a while so that they can fall asleep for the MRI. To do this, you might skip a morning nap or bring another person in the car with you to keep your child awake before the visit. We want the MRI visit to be as comfortable as possible for you and your child, so please do not hesitate to let us know what you think will work best. Where does the MRI visit take place? 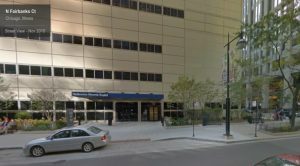 Our MRI scanner is located at the Center for Translational Imaging (CTI) in the Olson Pavilion at Northwestern University, 710 N. Fairbanks Court, Chicago, IL 60611. The MRI center is on the Lower Concourse level. The CTI building is just two blocks from the W2W lab visit location. We provide free parking in a nearby garage located at 222 E Huron St.
What happens during the MRI visit? When you arrive at CTI, a researcher will meet you and ask you to complete MRI safety forms for you and your child. After answering all your questions, the researcher will help you settle in to our Nap Room and prepare for helping your child fall asleep. We will provide a t-shirt for your child to wear during the MRI. We will also place soft foam earplugs into your child’s ears and small pieces of baby tape to hold them in place. The researcher will leave the room so you can complete your naptime routine, including nursing, listening to lullabies, or any activities that work well for you. After your child has been asleep for a few minutes, we will have you bring your child across the hall into the MRI scanner room. The researchers will help you lie the baby down on the scanner bed and tuck them in so they are secure and comfortable. We will allow the child to rest for a few moments at this point to help them stay asleep. We will then position your child so their head is within the MRI head cradle, placing headphones or small foam pads next to their head to give more noise protection and help keep their head still. The top of the head cradle goes over your child’s head, a bit like a football helmet. We will then slide the bed in so that your child’s head is the middle of the scanner. Collecting the MRI images takes about 35 minutes as we take a few different kinds of images. A member of the research team will remain with you in the MRI scanner room. Everyone in the scanner room will wear earplugs as well. We will be watching your child at all times to ensure that they are safe and comfortable, and you can stay with your child for the whole visit. The other team member will be in the control room next door to run the computer that collects the images. What happens if my child doesn’t fall asleep before the MRI or wakes up during the MRI? If your child does not fall asleep, then we can reschedule the MRI for a different day and/or time if you would like. If your child wakes up during the MRI scans, we will ask you to try to soothe them so they return to sleep. We will collect as many of the MRI images as we can. Unfortunately, we can only book a specific amount of time for the MRI scans due to availability and cost. We will work with you to make sure that we allow sufficient time for your child to fall asleep before entering the MRI scan room.